As the hustle and bustle of the holidays is winding down, I am sharing this delicious recipe for Raspberry Cheesecake that will delight all of your friends and family. Whether for a New Year’s celebration or “just because”…this dessert makes a spectacular display and tastes even better than it looks. I used to think that making cheesecake would be so difficult, and for that reason, I didn’t even attempt it for many years. Thankfully after finally giving it a shot, I found out that the belief that making cheesecake is difficult is a total misconception. The directions may look daunting, but give it a whirl. Just take it step by step and you’ll be done in no time. I think you’ll be delighted with the results. I know your family and friends will be! Preheat the oven to 350 degrees F. To make the crust, combine the Oatmeal Gem cookies, sugar, and melted butter until moistened. Pour into a 9-inch springform pan. With your hands, press the crumbs into the bottom of the pan and about 1-inch up the sides. Bake for 8 minutes. Cool to room temperature. Raise the oven temperature to 450 degrees F. To make the filling, cream the cream cheese and sugar in the bowl of an electric mixer fitted with a paddle attachment on medium-high speed until light and fluffy, about 5 minutes. Reduce the speed of the mixer to medium and add the eggs and egg yolks, 2 at a time, mixing well. Scrape down the bowl and beater, as necessary. With the mixer on low, add the sour cream, lemon zest, and vanilla. Mix thoroughly and pour into the cooled crust. Bake for 15 minutes. Turn the oven temperature down to 225 degrees F and bake for another 1 hour and 15 minutes. Turn the oven off and open the door wide. The cake will not be completely set in the center. Allow the cake to sit in the oven with the door open for 30 minutes. Take the cake out of the oven and allow it to sit at room temperature for another 2 to 3 hours, until completely cooled. Wrap and refrigerate overnight. Remove the cake from the springform pan by carefully running a hot knife around the outside of the cake. Leave the cake on the bottom of the springform pan for serving. To make the topping, melt the jelly in a small pan over low heat. In a bowl, toss the raspberries and the warm jelly gently until well mixed. Arrange the berries on top of the cake. Refrigerate until ready to serve. Note: I actually used a larger springform pan (at least 10-inch) as this makes a large cheesecake. If you use a 9 –inch, it will just be thicker. Enjoy! If you’ve never attempted to make cheesecake before, you won’t be sorry you tried this. For our next recipe, I’m going to move away from desserts and give you a recipe for a scrumptious breakfast casserole. You will need the following ingredients: bacon, ham, onion, a loaf of Berlin Natural Bakery spelt bread (any kind), potatoes (or frozen hash browns), cheddar cheese, eggs, milk, Worcestershire sauce and ground mustard. This is another recipe that can be assembled ahead and then baked the next day. Have a wonderful New Year. Until next time….Happy Baking!! With Christmas fast approaching, I am sharing a recipe for Pumpkin Streusel Trifle. This dessert looks so elegant and although it may give the impression otherwise, it is actually a very easy dessert to make. It can be made a day or two ahead of time and stored in the refrigerator. Trifles are typically assembled in a big glass bowl or container in order to display the various layers. I am including a recipe for homemade vanilla pudding, but if you prefer and you have no dietary restrictions that prevent you from eating it, you may make a 4.6 ounce box of vanilla pudding mix instead. But, I must say…the homemade vanilla pudding is much easier to make than I had imagined. It tastes so good and I really liked the idea of knowing exactly what it contains. For Homemade Vanilla Pudding: 1/3 cup white spelt flour 2/3 cup sugar Pinch of salt 1 tsp. vanilla 2 cups milk 2 eggs, beaten 1 ½ teaspoons butter In a small saucepan, combine the sugar, flour and salt. Gradually stir in milk. Cook and stir over medium heat until thickened and bubbly. Reduce heat; cook and stir 2 minutes longer. Remove from the heat. Stir about ½ cup hot filling into the beaten eggs to incorporate eggs. Return all to the pan, stirring constantly. Bring to a gentle boil; cook and stir 1 minute longer. Remove from the heat. Gently stir in butter and vanilla. Cool, stirring occasionally. (Will probably take about an hour to really cool). To make Pumpkin pudding for trifle: 1 – 30 oz can pumpkin puree ½ cups packed brown sugar 1/3 tsp. ground cinnamon or cardamom In a bowl, combine the pumpkin puree, the brown sugar and the cardamom or cinnamon. Stir in cooled pudding. Reserve in the refrigerator, covered with plastic wrap until assembling the trifle. To make Homemade Sweetened Whipped Cream: 1 pint heavy whipping cream ¼ cup granulated or powdered sugar ¼ teaspoon vanilla Whip whipping cream on high speed of mixer until begins to thicken. Turn mixer to lower speed and add sugar and vanilla. Once mixed in, return mixer to high speed and continue whipping cream until stiff peaks form. Refrigerate until assembling the trifle. Note: My husband loves homemade whipped cream, so to make sure I have enough for a thick layer; I usually make a double batch. To Assemble Trifle: One or two loaves of Berlin Natural Bakery Pumpkin Streusel Tea Bread, broken up into bite sized pieces. Layer half of the Pumpkin bread pieces on the bottom of a large clear bowl. Pour half of the pumpkin pudding mixture over the pumpkin bread and then add a layer of whipping cream. Repeat with the remaining pumpkin bread, pudding and whipping cream. Refrigerate overnight. For our next recipe, I will be sharing a delectable Raspberry Cheesecake recipe. For the crust, I will be using Berlin Natural Bakery Oatmeal Gem cookies. You will also need five 8 oz pkgs of cream cheese, 7 extra large eggs, sour cream, 2 lemons, 1 cup raspberry jelly or preserves, and 1 ½ to 2 cups red raspberries. (Instead of raspberries for the topping, you can use any fruit you prefer or use no topping at all). Until next time, may you and your loved ones experience true joy and happiness throughout this Christmas season. And may you get all your shopping done early!! Happy baking! Welcome back friends! What a breathtaking time of year we’ve been experiencing lately here in the Ohio Valley. The trees are beautiful with all the spectacular red and yellow leaves, especially when they glimmer in the sunlight. In contrast to the warm and sunny days, the nights are beginning to really get cool and we’ve even awakened a few mornings to frost on the ground. It can make it difficult to know what to wear when the temperature warms up 30 degrees or more from morning to afternoon, but I love it. On such cool mornings, the delicious French toast I told you about in my last blog is a perfect way to start out the morning. Everyone will probably think it took you forever to prepare it, but since you mix up the milk mixture the night before, this French toast is actually a very quick and easy breakfast to make on even the busiest mornings. Alison’s Vanilla Cream French Toast 1 egg 1 can Sweetened Condensed Milk 1 tsp. vanilla 1 tsp. cinnamon ¼ tsp. salt 1/3 cup milk 1 pkg of Berlin Natural Bakery Whole or White Spelt Burger Buns, or 1 loaf of any of Berlin Natural Bakery bread (I have used both the burger buns and Berlin Natural Bakery Biblical Bread and they have both held up great. If you are using a French bread or other dense bread, cut the loaf into approximately 1 inch thick slices). Mix the first 6 ingredients in a container. Cover and put into refrigerator overnight. Spread the buns or slices of bread on a cookie sheet or on your counter and leave them out overnight so they can dry out. Before using the egg/milk mixture, stir it again to make sure all the ingredients are mixed well. Dip the buns or slices of bread into the egg and milk mixture, leaving them in the mixture for 30 seconds on each side. Place them on a well-greased griddle or frying pan and brown them on both sides. Serve with soft butter and maple syrup. Note: If you forget to let the bread dry out, it’s not a problem. When you dip it in the egg and milk mixture, just do it for a shorter time as the bread will soak up the mixture quicker since it’s not dried out. Watch the temperature on your stove as this French toast browns pretty quickly. I usually start out with a medium high heat and once the pan or griddle gets hot, I turn it back to medium. (The way I test whether my pan is hot enough is to sprinkle just a few drops of water in the pan. If the water “sizzles” a little bit, the pan is ready, but if the water pops like crazy, the pan is probably a little too hot). The great thing about this toast, is that even if it gets a little overbrown, it’s still delicious. That just makes it more caramelized. I certainly hope you enjoy this breakfast as much as my husband and I do. I’m so thankful our daughter Alison made it for us and then shared her recipe. There’s no doubt that in a couple months, I’ll be wishing I was spending time with my sister Beth in Hawaii, but right now I am truly enjoying this time of year. Not only is autumn one of my favorite seasons because of the beautiful scenery here in Ohio, but it also means the holidays are just around the corner. With that in mind, for the next few blogs I am planning to share recipes for the holidays. The next recipe will be Thanksgiving Stuffing made in a slow cooker. For Thanksgiving dinner in our home, we always brine our turkey before baking it, and therefore we do not stuff it with the dressing. Since I don’t have extra room in my oven, I make my stuffing in a slow cooker. It works out perfectly. You’ll need the following ingredients for this recipe: butter, onion, celery, parsley, 1 to 2 loaves of Berlin Natural Bakery spelt bread (I usually use both white spelt bread and whole grain spelt bread, but this time I am going to try something different and use white spelt bread and raisin spelt bread. I’ll let you know how it turns out. ), salt, pepper, chicken broth, eggs and any or all of the following seasonings/herbs (poultry seasoning, sage, thyme and marjoram). I may also add pecans. It’s been great sharing another recipe with you. I love to bake. It almost seems like it was inevitable. Both of my grandmother's were excellent bakers. My mom even has many blue ribbons from our local county fair that she won for her tasty baked goods. Everything they baked was made from scratch, using sweet creamery butter, farm fresh eggs and ingredients that often came from their own farms or gardens. I can still smell the wonderful aroma of apple dumplings or cinnamon rolls or chocolate chip cookies baking in the oven when I would burst through the door after coming home from school. It's a wonder I didn't weigh 500 pounds. As children...we spent our days outdoors, exploring the woods, playing with the neighborhood kids, always on the go and just having a grand time. Though we didn't need to be concerned about watching our weight in those days I can no longer just stuff as many cookies or homemade donuts (yummy), or mouth watering pie in my mouth as I once could when I was young (and I wish I still could). My name is Cindy and for 17 years now I have worked for Berlin Natural Bakery. Berlin Natural Bakery is the largest all spelt bakery in the United States. Everything we bake is made using pure spelt flour (no regular wheat will be found in our bakery) and we use only the highest quality, all natural ingredients. The recipes you find here will be based on using spelt flour or products from Berlin Natural Bakery. Our desire is to help all who have contacted us with questions about baking with spelt. If you don't currently have spelt flour, don't despair...these recipes are easily adaptable. For those of you unfamiliar with Berlin Natural Bakery or spelt flour, check out the website www.BerlinNaturalBakery.com. It is my hope that this blog, and many more to be published, will convey to you that baking does not need to be difficult (even when using spelt flour) and that it can bring a whole lot of pleasure...both in the baking itself and in the joy of eating and sharing what you've created! Or, if you're like me and already love to bake, I hope to share some new and tasty recipes you'll enjoy baking. As I share my love of baking with you, I hope you will share your life with me as well. You may come as a stranger, but I want you to leave as a friend. Feel free to ask any questions, or share your suggestions and recipes. It is a real privilege to get to know you. Now then...it's time to get started. It seems only appropriate since this is my first blog that for our first recipe, we start with the first meal of the day as well...breakfast. I'm one of those people who love breakfast. This recipe comes from a friend, Christy from Zoar, Ohio which she developed using spelt flour, freshly stone ground at Berlin Natural Bakery. 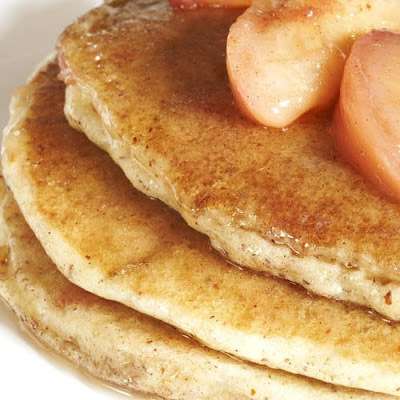 For the best pancakes or waffles, this recipe is hard to beat. Well friends, that's it for this time. The next time we gather together, I am going to share another great breakfast recipe...French Toast. You may be thinking, "that doesn't sound very exciting", but this is not just any French toast. My daughter Alison made this scrumptious French toast for my husband and me early one morning before she had to take us to the airport. It was oh so good and made the start of our day all that much better. Since I hate finding a great recipe, only to have to make a trip to the store for ingredients before I can actually make it, I thought I would share the ingredients you'll need now so you'll be ready to go when I post the next blog. Most of the recipes are things you probably have in your kitchen already (vanilla, eggs, sugar, cinnamon, nutmeg and salt), but two of the ingredients you may not have. My daughter used a loaf of French bread that she sliced into thick pieces, but when I made it, I used White Spelt Burger Buns from Berlin Natural Bakery. May sound crazy, but they worked perfectly. The Berlin Natural Bakery Raisin Spelt Bread would work equally well for this recipe. You will also need a can of sweetened condensed milk. This gives a caramelized outer covering that is...well; I'll just say this...you're going to love it! You can find premier spelt products made from 100% genuine german spelt in our online store by clicking the icon below!